Easy, super fast pasta recipes that come together in minutes. Everyone should have a handful of easy pasta recipes in their back pocket. And every parent should have a handful of easy, super fast pasta recipes in theirs. The key to serving weeknight noodles in minutes is taking advantage of a few key fridge and pantry staples, like with these 11 pasta recipes that I cannot get enough of. Here are some ingredients you should keep on hand at all times, and the pasta recipes that you can make with them. Then, a dinner in minutes is always at the ready. I make a version of the One Pot Sausage Spinach Pasta at The Kolb Corner (above) monthly, and my kids would be happy if I did so weekly. Chicken sausage just needs a quick sauté, and any tender, quick-cooking green (arugula, spinach, baby kale) will do. 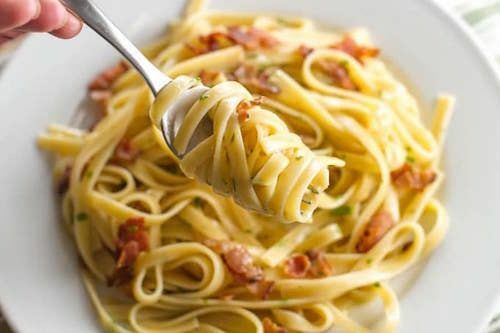 The 15-Minute Carbonara at Girl Gone Gourmet is the ultimate sh**-I-have-nothing-for-dinner dinner. You’ll be amazed at how a little bacon and egg can turn simple pasta into a comforting — even decadent — dinner. Just be sure to keep a bit of the starchy pasta water to add to the sauce; this will help lighten the sauce. 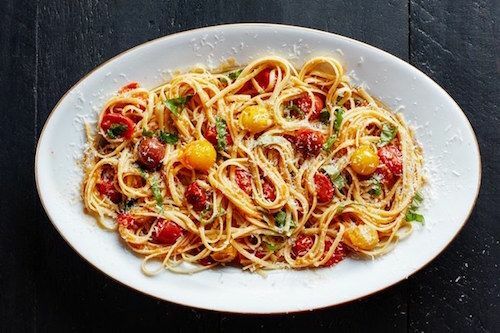 The Pasta with 15-Minute Burst Cherry Tomato Sauce at Epicurious is the queen of easy pasta recipes. All you need are some tomatoes, garlic, and a little heat. I love to make this when I’ve got a bunch of tomatoes that are on the verge of going bad — reducing food waste, a plus! 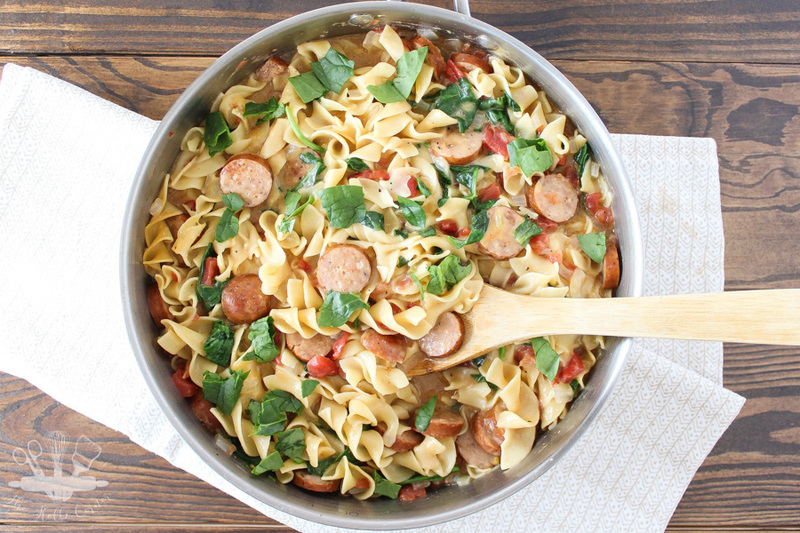 Related: 6 mouthwatering no-cook pasta sauce recipes that save the day. 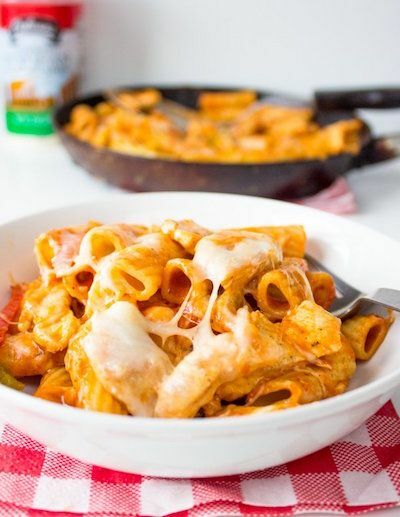 It’s hard to cook a protein in minutes, but the Quick and Easy 15-minute Chicken Pasta at Gimme Delicious smartly takes advantage of sliced chicken and peppers to make a satisfying and nutritious dinner. 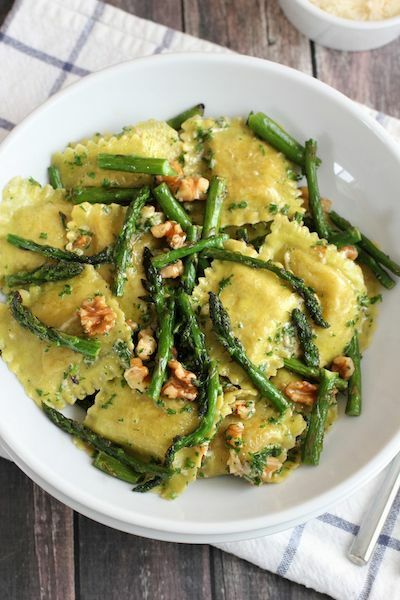 Take advantage of spring asparagus as Geraldine does in this recipe for Ravioli with Sautéed Asparagus and Walnuts at Green Valley Kitchen. Walnuts add a crunchy texture that elevates this dish into something truly wonderful, and they stay fresh for months kept in the freezer. The carb lovers don’t get to have all the fun. 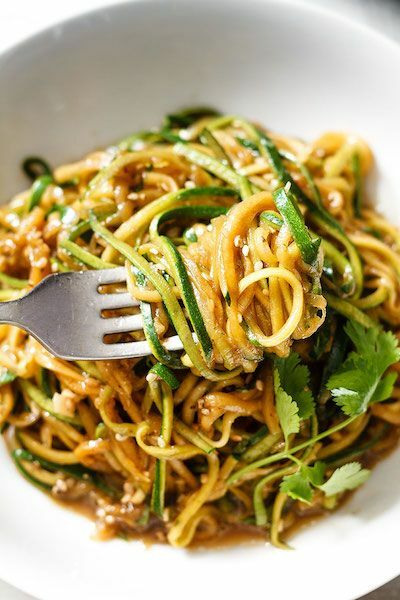 These Teriyaki Zucchini Noodles at Eat Well 101 would make quick and delicious use of some pre-spiralized zoodles. Sauté, make a sauce, and mix — take that, Monday. Related: 8 super quick curry recipes that will make you forget all about takeout. 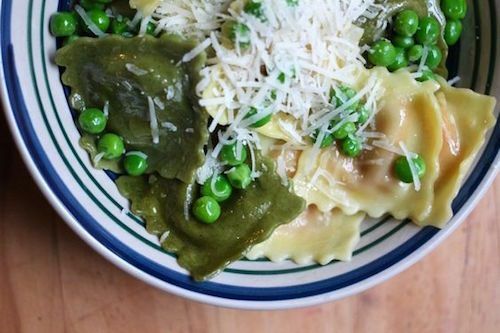 The simple combination of ingredients in the Ravioli with Peas and Garlic at Seek Satiation are a favorite among both kids and grown-ups. All of the ingredients come from the freezer or fridge, and can be ready by the time the kids have unloaded the day’s artwork from their backpacks. When Stacie featured the Pasta con Ceci at Dinner A Love Story in one of our [totally awesome and helpful] weekly meal plans, I immediately bookmarked it for a weeknight dinner. 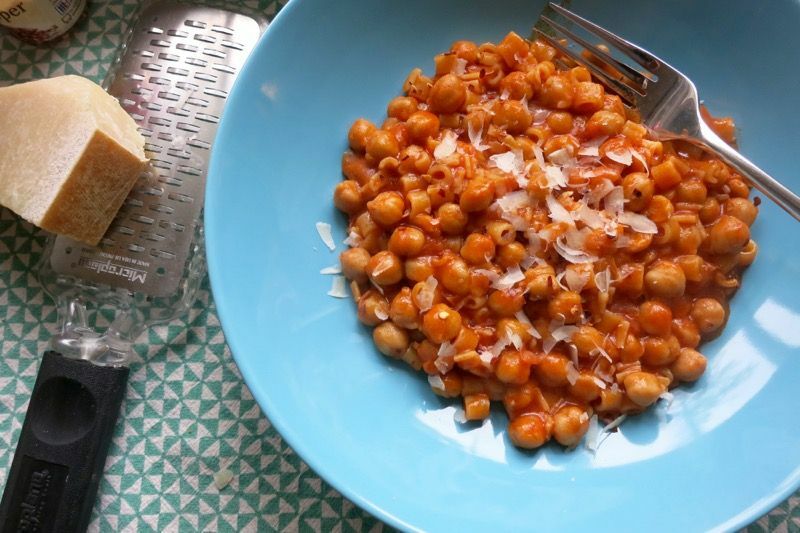 Canned chickpeas and some good olive oil turn pantry pasta into the coziest family meal. Just make extra, because this is even better as a leftover lunch the next day. 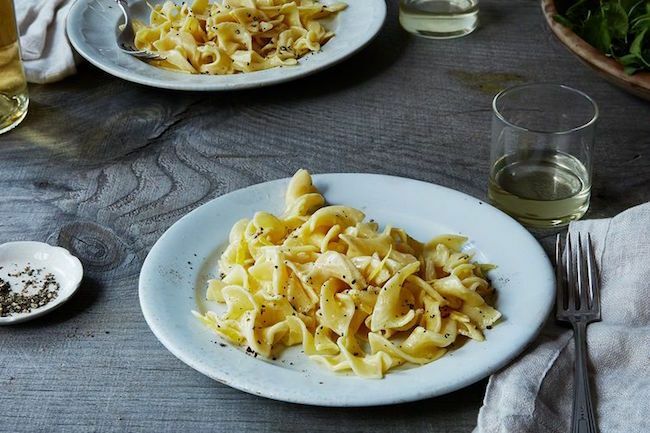 You’ll look at the ingredient list for Barbara Kafka’s Creamy Lemon Pasta at Food52 and wonder if it will amount to much — but, trust me, it does. And it’s the perfect backdrop for any quick- cooking green vegetable or even shrimp, if you want to add protein. PRO TIP: Be sure to check out this genius cooking shortcut for how to cook green veggies for pasta super fast using just one pot. Related: How to cook pasta ahead of time so that it’s ready and waiting. For the best prepared pesto, go to the refrigerator section and seek out the freshly made stuff. Or make your own — follow simple pesto recipe and it’ll come together in a blender by the time your pasta cooks. 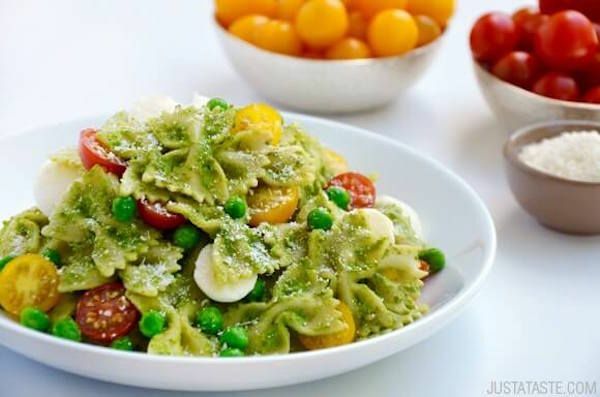 I often don’t have enough fresh basil in the house for a traditional pesto, so I love to use spinach or even peas, as Kelly does in her Pea Pesto Pasta at Just A Taste. It’s the perfect adaptation for spring! 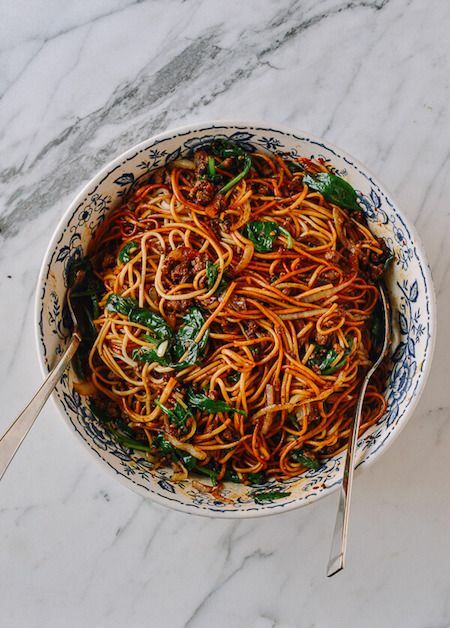 I’m craving this savory and wholesome recipe for 15-Minute Lazy Noodles at The Woks of Life. You have to do a little cooking in addition to boiling noodles, but I usually have cooked ground beef in the freezer from when I follow this quick batch cooking trick, and the sauce and veggies come together in no time. Be sure to read Sarah’s notes: I love how she encourages readers to be flexible with the recipe.